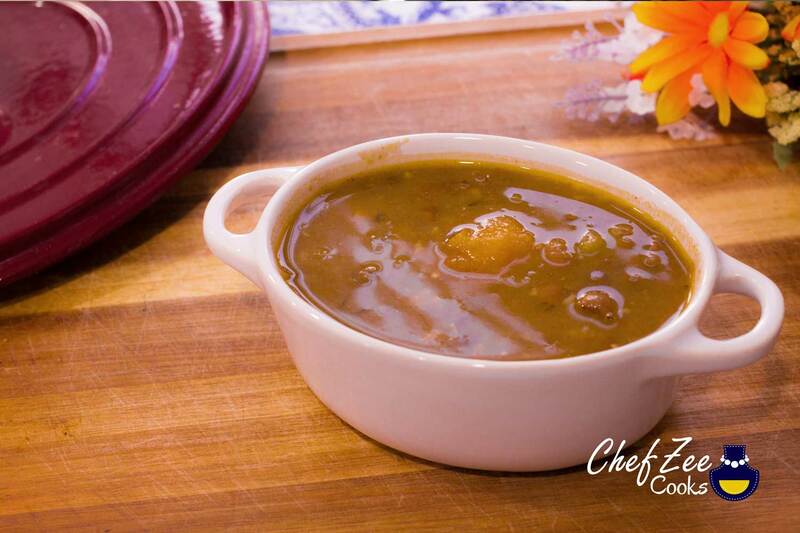 One of the best treats of Dominican cuisine is the various traditional bean recipes that we make. Gandules Guisados is one of those dishes that instantly transports me to my childhood. My grandmother would typically make this on Sundays with white rice, pork chops, tostones, and batata fritas. It’s a dish that tastes better the next day but would hardly ever see day 2 because everyone in the house would eat them all up that same day! These beans rival my love for Dominican Red Beans and even Cuban Black Beans. They’re slightly sweet because of the Auyama, which is hands down my favorite part of this whole entire dish. This dish is traditional not only for Dominicans but for Puerto Ricans as well. Funny enough, unlike Moro de Gandules which I’ve nicknamed the turned up rice since it’s the must have rice dish at any party or family gathering, Gandules Guisados aka Stewed Pigeon Peas is a dish that you hardly ever see at parties. It’s one that is reserved for the home. It’s cozy, tasty, and the epitome of comfort foods. Making this dish is fairly simple but it does require some ingredients that may be hard to come by such as: Auyama (Kobocha Squash) which you can replace with Jamaican Pumpkin or even Sweet Potatoes. I’ve tried both and they’re both out of this world! In fact, I would make Gandules Guisados all the time in college where there wasn’t an auyama in sight! It was here that I discovered that sweet potato are an amazing substitute. Just like auyama, sweet potatoes will give the Gandules Guisados a subtle earthy sweetness which instantly makes this dish cozy and comforting. Another ingredient that’s pretty hard to come by is Dominican Orégano. Dominican Orégano is different than regular off the shelf orégano because Dominican Orégano has a citrusy undertone. I have a video where I explain the different in detail on my YouTube channel. Nonetheless, if you can’t find Dominican Orégano in your local grocery store then you can definitely use regular ground orégano. Last but not least, I like to mash half of my gandules BEFORE I cook them because this is going to thicken my gandules. I simply do this by hand but feel free to use a hand mixer, food processor, or blender to do this. I grew up watching my grandmother do this and I now do this myself. It’s a way for me to keep her memory and legacy alive. Very delicious. My family loved this! Yay! This makes me so happy!